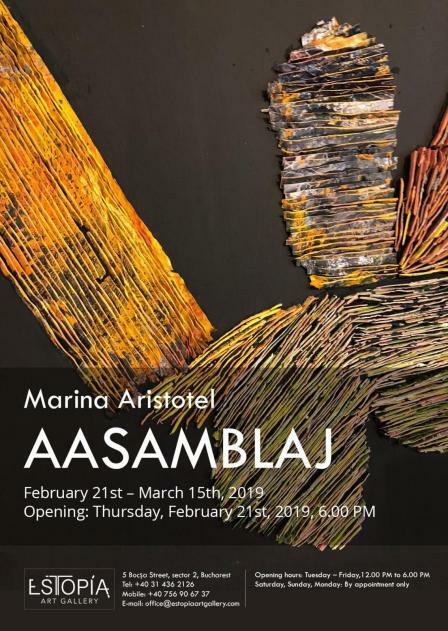 Estopia is pleased to announce the second exhibition on the agenda of its project focused on showcasing the most innovative Romanian young artists: AASAMBLAJ by Marina Aristotel. With a BA and MA in Painting earned from the Bucharest University of Arts, Marina Aristotel has shaped herself a distinct profile among the young Romanian abstracts, by choosing to work with a media that has become in the past few years her dominant visual mark: resin. Her new series, AASAMBLAJ, brings forth a surprising change in the artist’s path: cuts, assemblage and layering, together with a diversification of working materials, are all part of a manifesto for flexibility, one in which the artist plays freely with the pieces of her work, while recomposing different slices of life into a renewed, coherent and revealing approach. In this new assemblage, the resin displays are primary pieces to showcase a singular moment framed, instilled in time and mind, unalterable by the outside world, while the superposition of various layers coming with the latest series provide a cross section of moments, colors and emotions: an experimental collage, where initial impulse and geometric control meet into a surprisingly vivid show of chromatic explorations, light and shapes. Aristotel’s works truly reflect the application of a three dimensional reconstruction of vision and memories through contemporary techniques, in a fresh and refined artistic approach. Born in 1985, Marina Aristotel lives and works in Bucharest. She graduated in Painting from the National University of Arts, Bucharest, in 2015, and earned her MA in the same field in 2017. Trained as a painter, she oriented herself towards towards resin as main media, while experimenting with installation and other media and techniques. Her new series, #AASAMBLAJ, brings forward a new approach, which combines painting, layering and assemblage, while focusing on abstraction as the means to express best her artistic vision. She participated in several group shows such as, in Bucharest, Death, LaBorna Gallery; Diploma, Palatul Știrbei, and Atelier 19&34, Visual Arts Center; Spatial Activity Studio 9, a workshop held by prof. Slawomir Brzsoska and Rafal Gorczynski, Poznan University, UNA Galeria, in 2017; and An Abstract Feeling, 418 Gallery, Bucharest, 2016, among others.